The Bolivia Road Bridge over the North Fork of the Sangamon River, 20 miles southeast of Springfield, connects Sangamon County with Christian County. Bolivia (pronounced in central Illinois as “Bolivee”) was an early community located along the road that connected Springfield with Decatur. The town was later moved a short distance south of its original location so it would be on a railroad line constructed through there in the early 1900s. 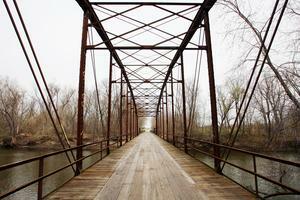 The Bolivia Road Bridge, built in 1901, is a through truss bridge. It has been listed on the National Register of Historic Places since 2004. In 1994, the state Department of Transportation identified the Bolivia Road Bridge as one of only seven bridges of its type in Illinois. Landmarks Illinois selected the bridge as one of the 10 Most Endangered Historic Places in Illinois in 2011. This entry was posted in Architecture, National Register, Transportation and tagged Christian County, North Fork of the Sangamon. Bookmark the permalink.